War has arrived to the system of Kaballas. I can't believe it's been two moons since I escaped the grasp of the Sororitas, and now we're to run again. It almost feels like our task is cursed, but I'm determined as ever to see this through. The organisation has made every effort to protect our journey, but reliable allies are hard to find. 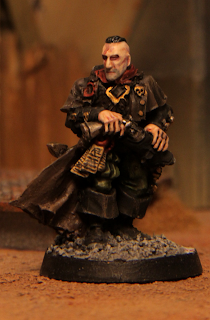 Once I thought we could trust the Guard, the Arbites and the Astartes, but it seems that greed and deception is a brand on the flesh of the humanity. I thought we'd be different from the greenskin savages or the denizens of the warp. It seems I was wrong. It seems war is all we are. Yesterday saw a gathering of our most stalwart agents. According to our spies we still have time to arrange a planetside transportation to the Port Aurelius. Communication with the organisation has been fitful at best lately, but I hope to rejoin their company once we're off Kaballas. Using my contacts I've secured a temporary retinue in an oblivious imperial detachment, which should make the extraction that much easier.